Carlo Corinto cologne for men is a traditional yet subtly masculine fragrance that has been around since 1984 and is ideal for casual use. This popular and versatile cologne is presented in an attractive bottle and green packaging and features both woody and mossy top notes, together with a rich base note of sensual ambergris. No man can resist the quiet notes of this fashionable cologne, and when men wear it, they are sure to receive compliments on their distinctive scent. Does anyone else think this smells like Deseo for Men by Jennifer Lopez? 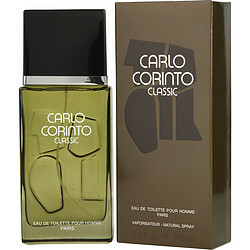 Unlike Deseo, Carlo Corinto Classic gives me more longevity, easily get 8 to 10 hours. Perfect Summer fragrance if you're tired of the usual Summer mall fragrance releases. Repeat user. If you liked Gucci Nobile, this cologne is a very close second. Great smelling and lasts all day. Highly recommend it..